The song remains the same. This time last year, CEO Les Moonves made it clear he’d like to see The Big Bang Theory TV show continue past its 12th season. While the 11th season of the long-running hit sitcom just ended last week, and season 12 is yet to premiere on Thursdays at 8:00pm in the fall of 2018, at todays Upfront presentation, CBS Entertainment President Kelly Kahl said the network would love to renew The Big Bang Theory for season 13 and more. At the CBS upfront breakfast, the network’s entertainment president Kelly Kahl noted that this season, Big Bang is “zero down” from Season 10, adding that, when all delayed viewing for the highly-rated Sheldon-Amy wedding finale is factored in, the comedy, from comedy star Chuck Lorre, may end up up year-to-year. With performance like that, “we are hopeful that there will be more” seasons of Big Bang beyond the upcoming 12th,” Kahl said. Big Bang comes from Warner Bros. TV, which will have to negotiate new contracts for the series’ cast for Season 13. The show’s original quintet are the highest-paid actors on TV with paychecks of around $1 million an episode. Early on this year, Galecki said he was comfortable with season 12 being the final season of The Big Bang Theory. Whether the cast (some of whom took pay cuts for the 11th and 12 seasons) will have the will to continue beyond season 12 remains to be seen. The 11th season of The Big Bang averaged a 2.74 rating in the 18-49 demographic and 14.04 million viewers. Compared to season 10, the sitcom was down by 12% in the demo and even in viewership. Even in season 11, it was the top-rated CBS TV show. What do you think? 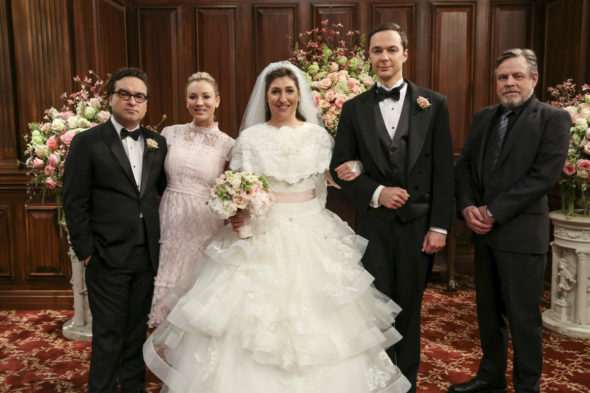 How many more seasons do you think The Big Bang Theory TV series should continue on CBS? I hate to see it end. We love the show & would love it to continue. Best comedy on tv. I would love to see it continue. It is still the best comedy on tv.